The flag of Ethiopia is a horizontal tricolor of green, yellow, and red from top to bottom. Centered on the flag is a blue circle with a yellow five-pointed star. The flag of Ethiopia was adopted on August 28, 2009. The flag of Ethiopia has three horizontal stripes of green, yellow, and red from top to bottom. Centered over these stripes is a blue circle, on which there is a yellow five-pointed star. The green, yellow, and red colors have been used frequently to represent the region, often called Pan-African colors. The green typically represents hope and the land's fertility, the yellow is for harmony among the Ethiopian people, and red represents valor and war, depicting the fight for independence and resistance to colonist takeover. The bright star symbolizes the future of the nation, and may also reference King Solomon as the Star of David. 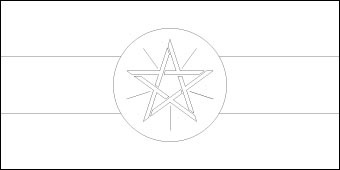 Surrounding the five-pointed star are five yellow rays, symbolic of the equality of the diverse people of Ethiopia. The flag of Ethiopia was first standardized as part of Ethiopia's Constitution in 1995, but some changes were made to it in the following years. The current version of the flag, which has the star emblem on a blue circle, became the official national flag in 2009. The flag remained largely unchanged from the constitutional specifications, but the blue circle has been enlarged. Before this, the colors green, yellow, and red had been used in the region since the seventeenth century. The former Ethiopian Empire, which lasted from around 1137 to 1975. One version of a former flag of Ethiopia was made up of three pennants, one in each of these colors. For many years, the Lion of Judah was emblazoned across the royal flag of Ethiopia, which also featured the red, green, and yellow color scheme. Design and Colors A horizontal tricolor of green, yellow and red with the national emblem of Ethiopia superimposed at the center.